This is the installation video for the TJ/YJ Wrangler Gas Tank Skid from JcrOffroad. As we headed over the top of the pass and the valley opened up below, I realized that most of the photos and videos I’d seen of this trail were solely of the one-way section a mile or so ahead of us, the switchbacks. Up until then, we had been driving on two vehicle wide service roads, and while beautiful they looked much like any pass in Colorado; not yet iconic trail status. The view below was getting harder to ignore, however. 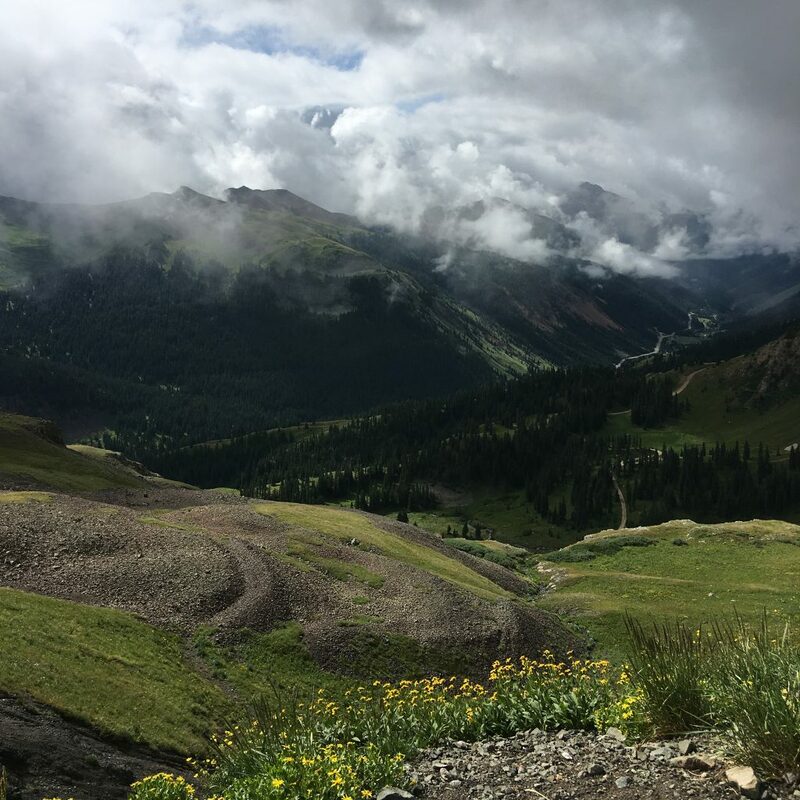 As our convoy of six Jeeps headed closer to the start of the switchbacks, the valley opened up to stunning views of Telluride, at that point about 3,000 feet below us. 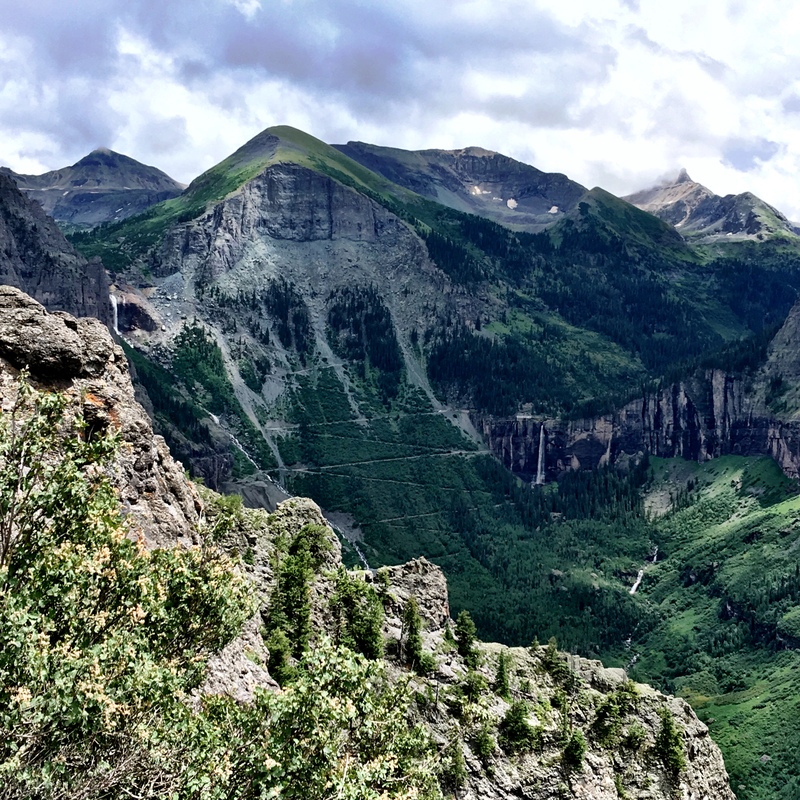 Telluride in the far top right. We passed signs that stated “Extreme Road Ahead | Expert Drivers with High Clearance, Short Wheelbase Vehicle only.” Now we were getting somewhere. The trail continued to lazily switchback downward, a small rock pile here, a ledge there, nothing that a stock 4×4 could not handle. The landscape, however, continued to get more stunning. A deep valley to our left sat in the morning shadow of peaks above us, with Ingram Lake reflecting the blues and greens; the view out the windshield is of Telluride, framed by mountain peaks with a soft vignette of white clouds. It would be like a Bob Ross painting if Mr. Ross painted Jeep trails instead of happy little trees. The voice of Clay, our guide and member of the local 4×4 club The Wild Bunch, came over the CB, “We are coming up to the steps. If you’d like, I can go down first and walk back up to give you a spot.” The steps he spoke of are the only real “obstacle” on the pass; they are a series of three rocky ledges with uneven rock between. Their iconic status comes from the fact that on the right side of your vehicle is a wall going straight up, and maybe 3 feet to the left is a ledge going straight down 15 feet or so into a creek, then over Ingram falls, another ledge, finally doom. Plus they are slightly cambered toward the danger side, not the safe side; it’s the kind of obstacle people talk about conquering over post trail beers. The Steps. A left turn or a slide of a white rock would lead to disaster here. Knowing this information already, I thanked Clay for his offer but followed behind his TJ down the obstacle without the spot. The rest of our group followed me. Even though the surface was slightly damp that day, we made it down the steps without issue and made the sharp right turn at the bottom to a stunning view of the valley below, and our first tight switchback. 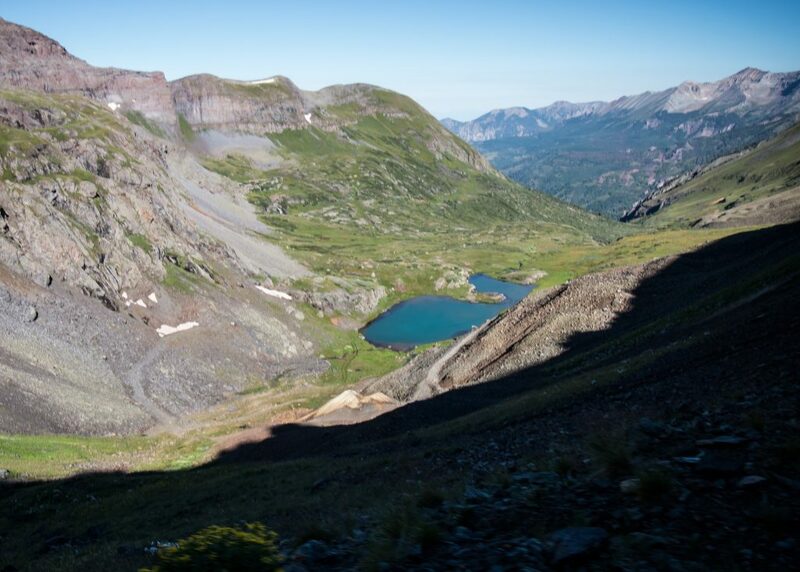 The thing about the Black Bear Pass that scares most people is the fact that the top of the switchbacks are an extremely narrow shelf road with full exposure to the road below. 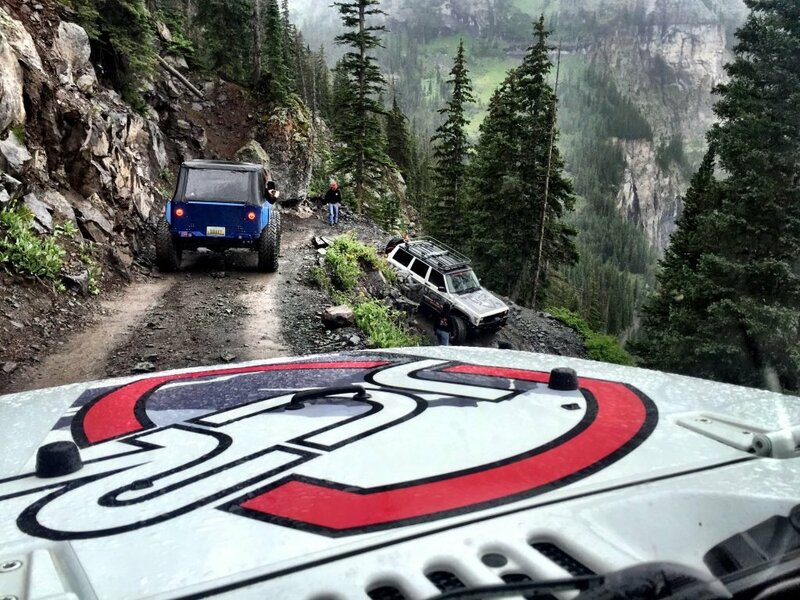 If you make a mistake, or have a vehicle failure and drive off that shelf, you will likely take a ride all the way to the bottom of the pass; this is widely regarded as a bad move. The danger is compounded by the fact that most turns of the switchback are 3 point turns. I.E. 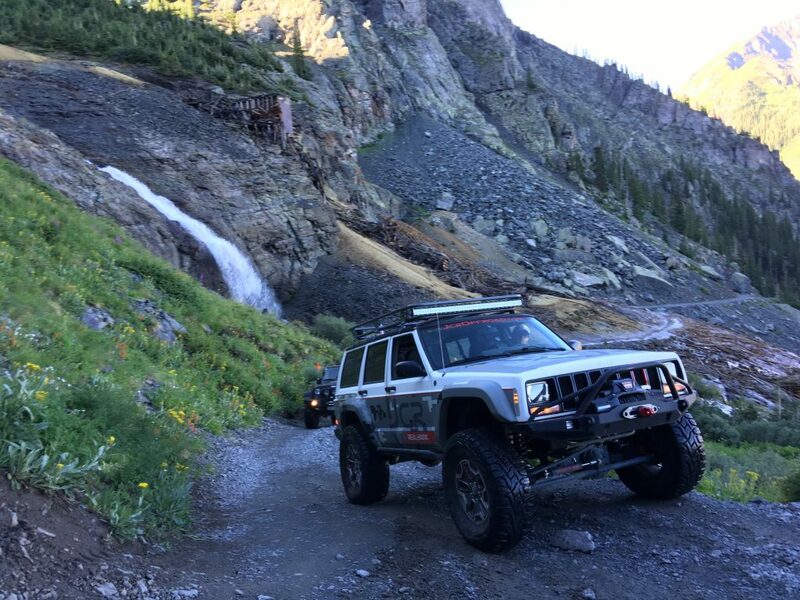 pull your front tires up to the very edge of the shelf, look over the hood at open sky, break out in a cold sweat, turn opposite lock, reverse up a steep wall, try not to roll over, turn to opposite lock again, then continue down the trail. It’s honestly as technical as backing out of a tight spot at the mall, but with much more to lose than a shopping cart scratch. After the first switchback, we crossed over Ingram Creek which was flowing steadily over the shelf road. 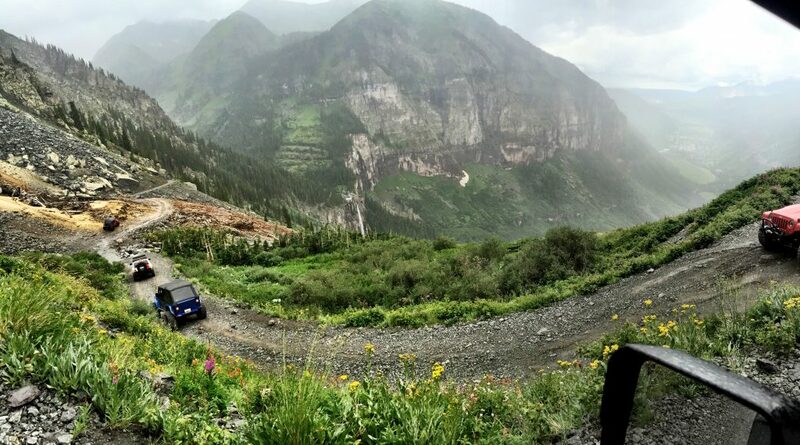 We each stopped in the creek and took photos of the Jeeps, the mountains, and Telluride below. I did some Bro Yoga on the roof rack of the Cherokee because I’m an idiot. Then it started to rain. Never having had been on this trail before, I was unsure if rain was an issue. Our guide Clay seemed un-phased by this new development. We continued. The next switchback was the iconic one you’ve seen in every video about the pass, but it’s the same three point turn as most of the other. The difference being this one is a little bit tighter, but has the benefit of a few pine trees that will slow your descent off the mountain just enough to give you time to think about your terrible life choices. Our travel though this turn was uneventful, as were the next few all the way to Bridal Veil Falls. The road, the turns, and our comfort level seemed to increase in breadth as we got nearer the bottom. The view, though, my God the view. As we turned one switchback, in front of us loomed Bridal Veil Falls in the distance, the second highest waterfall in Colorado, with a 2.5 story powerhouse on the cliff edge directly next to it. The powerhouse, built for the Smuggler-Union Mine in 1907, still generates 25% of Telluride’s power. It was a magnificent sight as we continued down the pass. Bridal Veil Falls, far center. As we get nearer the bottom and to the base of the Bridal Veil Falls, the pass opened back up to two-way traffic. This section of the trail is frequented by hikers, mini-vans, and strollers; so our exclusivity diminished as we made the 3 or 4 more turns to the bottom with our new two wheel drive friends. Back down in the land of minivans and strollers. Bridal Veil Falls above. 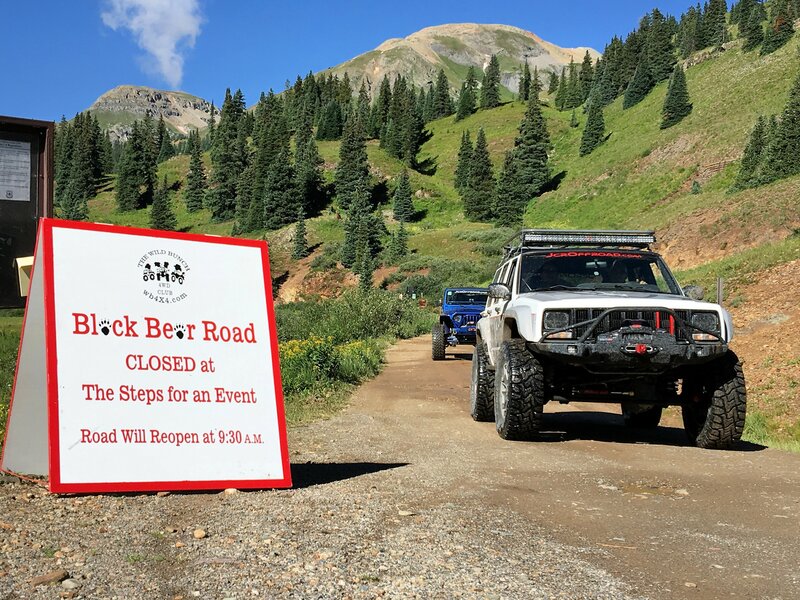 Two days every year the Wild Bunch 4×4 Club gets permission to close the pass early in the morning and leads one or two groups up the typically one-way pass. This year we had the pleasure of going on this ride the next day, and I’ll be honest, I thought this story was going to be about that. The wheeling was more exciting as we had to climb obstacles we just rolled over the day before, and the steps were wet and sketchy. I had to bump it up them even aired down with both lockers. But it wasn’t as awe-inspiring as my first time down the day before, and it didn’t have Telluride 3,000 feet below framed by the windshield. The wrong way on a one way. Would I recommend driving up Black Bear Pass? Of course, even if only for bragging rights. But down Black Bear Pass? A must drive trail. I’ll even go as far as to say the vehicle doesn’t matter. Rent a Renegade at the airport if you must. 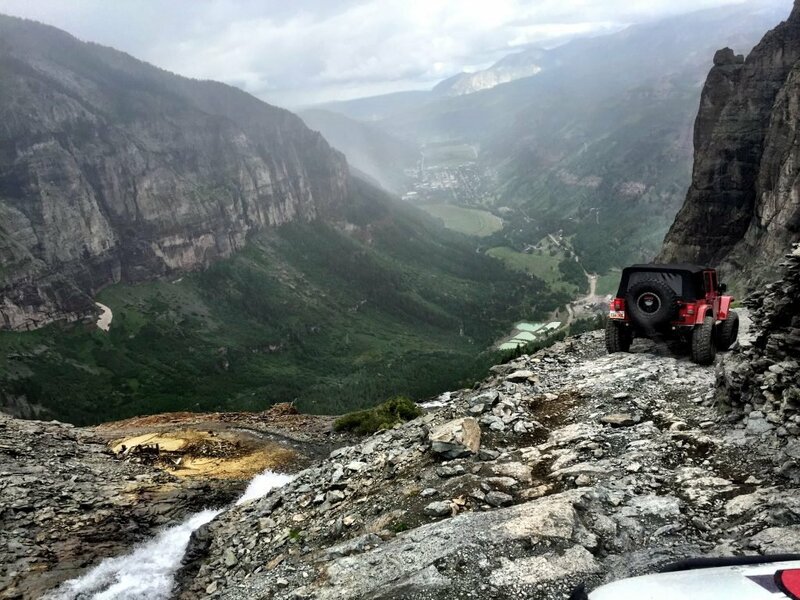 It will do just fine, and once you see that view, you won’t care that your trail monster is at home in the garage. Like many trails in Colorado, it’s not about the trail itself, but where the trail takes you. @apocdesign did a quick sketch of his ideas for our new MJ. What do you think? Michigan is 180 years old today! (Jan. 26, 1837) To celebrate, let’s see how the transplants do with some Michigan trivia! 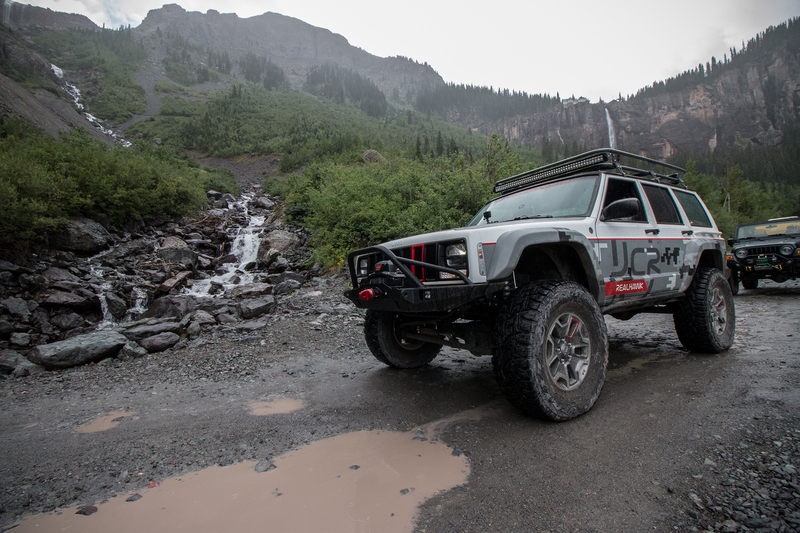 Our Vanguard XJ Front Winch Bumper is built for whatever you can throw at it.